Often-used Dossier Templates can be added to the Applications pane of the Home page in Content Station so that they can be easily accessed by users. 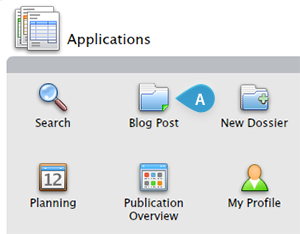 Figure: A Dossier Template name 'Blog Post' (A) added to the Applications pane in Content Station. Adding a Dossier to Content Station is done by assigning a user group to a Dossier Template in Enterprise Server. All users that are part of that group will see the Dossier Template in their Application pane in Content Station. 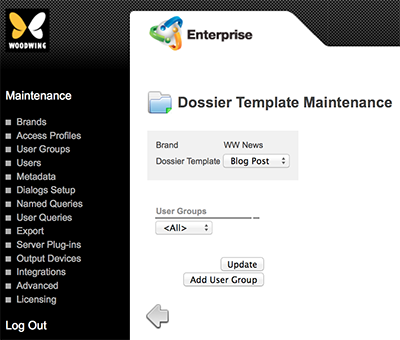 For periodic Brands (such as magazines and newspapers), Dossier Templates are added on the Brand Maintenance page. For project-oriented Brands (typically used by book publishers and advertising agencies), Dossier Templates are added on the Issue Maintenance page. Step 1. Make sure that the Dossier Templates that need to be added have been created by using the Planning Application in Content Station. See Working with Dossiers in Content Station 9. Step 2. Make sure that the Enterprise Server plug-in named Content Station List Dossiers is enabled. For more information about Server plug-ins, see Enterprise Server plug-ins. Step 4. Locate the Dossier Templates options. Since we are working with a newly created Brand/Issue, no Dossier templates have been added yet. The Dossier Template Maintenance page appears. The Dossier Template list at the top of the page contains all available Dossier templates and acts as a filter for the lower-half of the page. By choosing a Dossier Template from the list, all user groups that have been added to the Dossier Template will be listed in the lower-half of the page (if any). Step 6. From the Dossier Template list, choose the Dossier Template to which you want to add a user group. Step 7. From the User Group list, choose the user group for which the Dossier Template should be accessible in Content Station. Step 9. Continue adding user groups to Dossier Templates by repeating steps 6 – 8. You have reached the final step of the setup process: no further steps are necessary.